Hello friends! I'm about to fall asleep after eating a very carb-loaded lunch at work so hopefully I don't make too many typos as I'm writing this to ya. I get so excited when I see a "What's In My Bag" video in my YouTube subscription box. I really don't know why I love watching these videos so much... maybe because I can get inspiration from the kind of bag they're using, or for things that are necessary to carry or interesting to have. 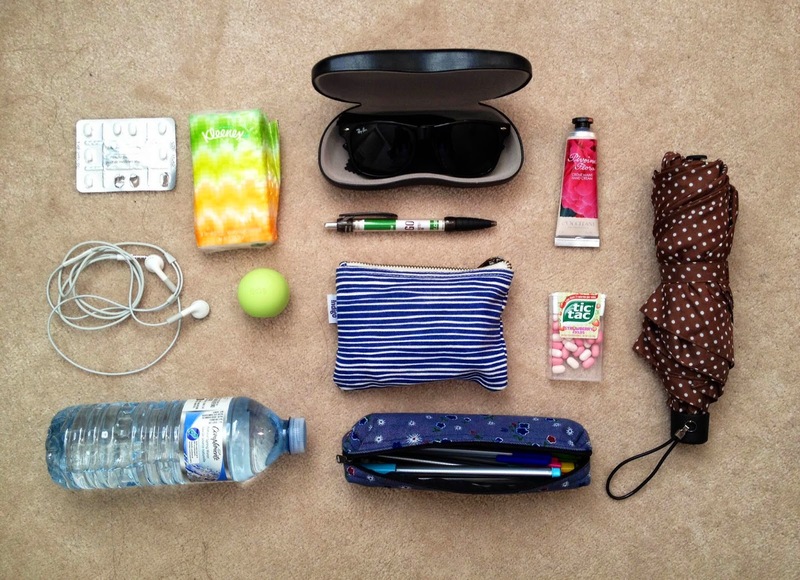 All in all it satisfies my curiosity to see what people have in their bags haha. Here is my version in the form of a blog post! I've been working full-time at an office so the majority of my summer is spent sitting at this desk where I'm writing right now. This is the Tommy Hilfiger bag that I take everyday because it's large enough to carry what I need and I'd say it looks professional enough! 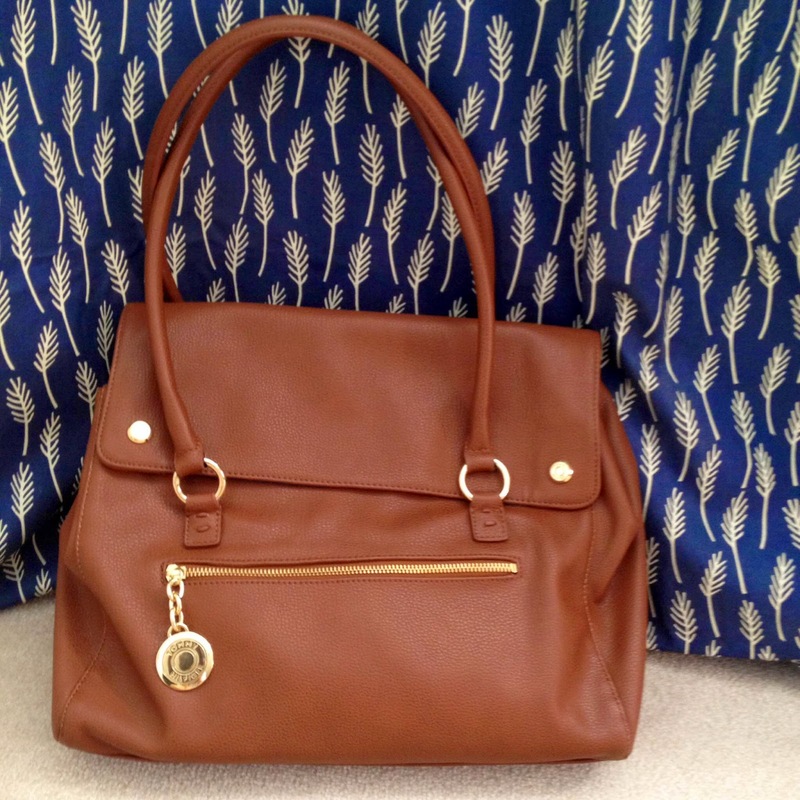 It's very functional with many pockets and lots of space. I keep this cute Stitch card and change holder in the small zipper pocket on the outside. I've been using this since my second year of undergrad and it's still intact (although one ear is completely lost and the other is on it's last leg). This was bought in Hong Kong and I keep my bus pass and some loose change in this. 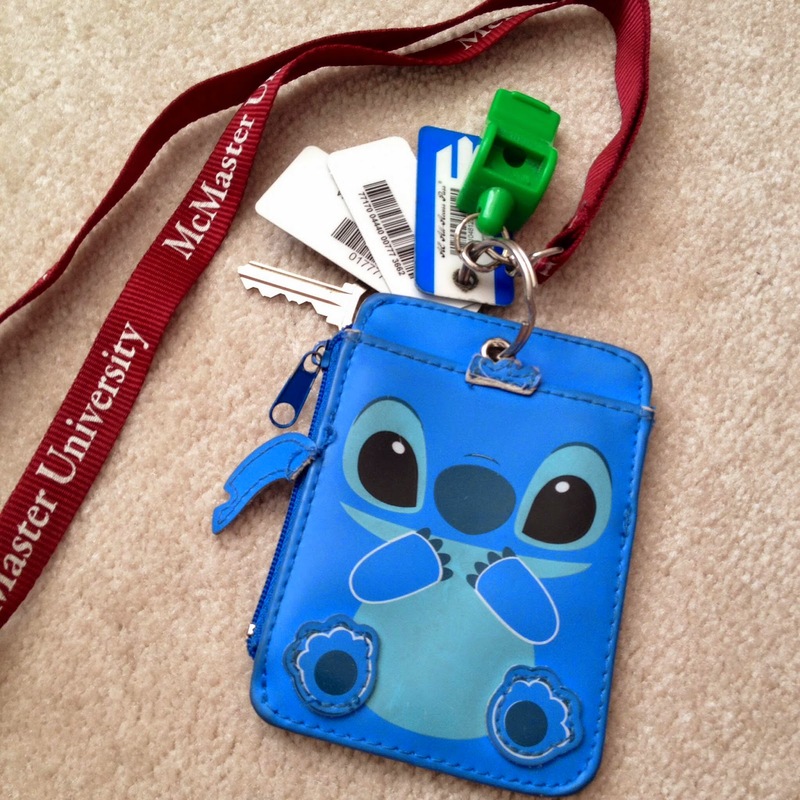 My home key, keytags, and whistle are also kept on this along with my lanyard (repping my alma mater!). I keep my miscellaneous stuff in the large compartment closest to the front of my bag. The back compartment is to carry things required for work. - My iPhone 4S resides in the little pocket made to carry your cell (not shown because I'm using it to take these pictures). - Reactine allergy medication for my seasonal allergies. - My Perch umbrella from Hong Kong is very lightweight and I love the polka dot pattern. - Tic Tac in the "Strawberry Fields" flavour to satisfy a sudden sweet tooth. 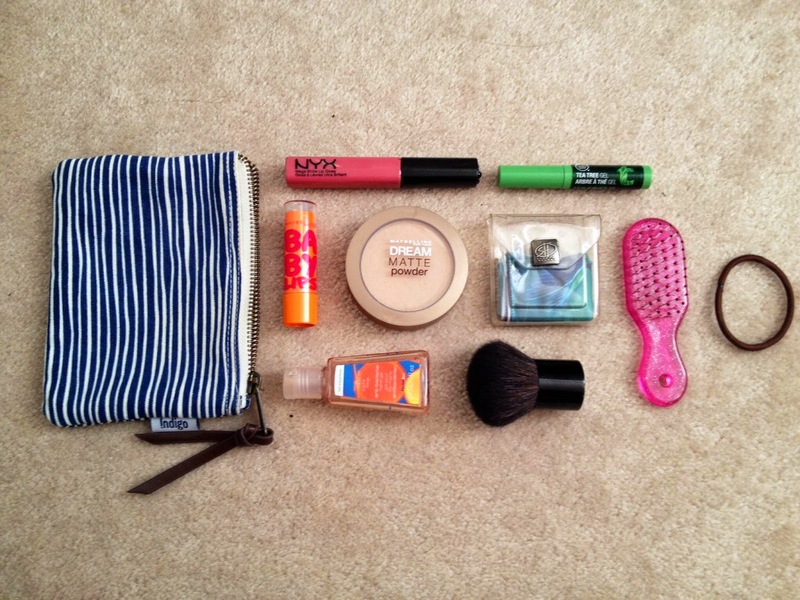 - My striped "beauty" pouch from Indigo, it was on clearance for only $2! - The EOS lipbalm in "Honeydew". - The earphones that I carry are the ones that came with my phone. - Water to stay hydrated at work. In this pouch I keep: some sort of lip product (currently it's Maybelline Baby Lips in "Cherry Me", Nyx lip gloss in "Beige"), Maybelline Dream Matte Powder (so sad it's discontinued *cry*), Body Shop Tea Tree Gel for acne spot treating, glasses wipe, hairbrush, hairtie, small Kabuki brush and my Bath & Body Works hand sanatizer in "Orange Sapphire". 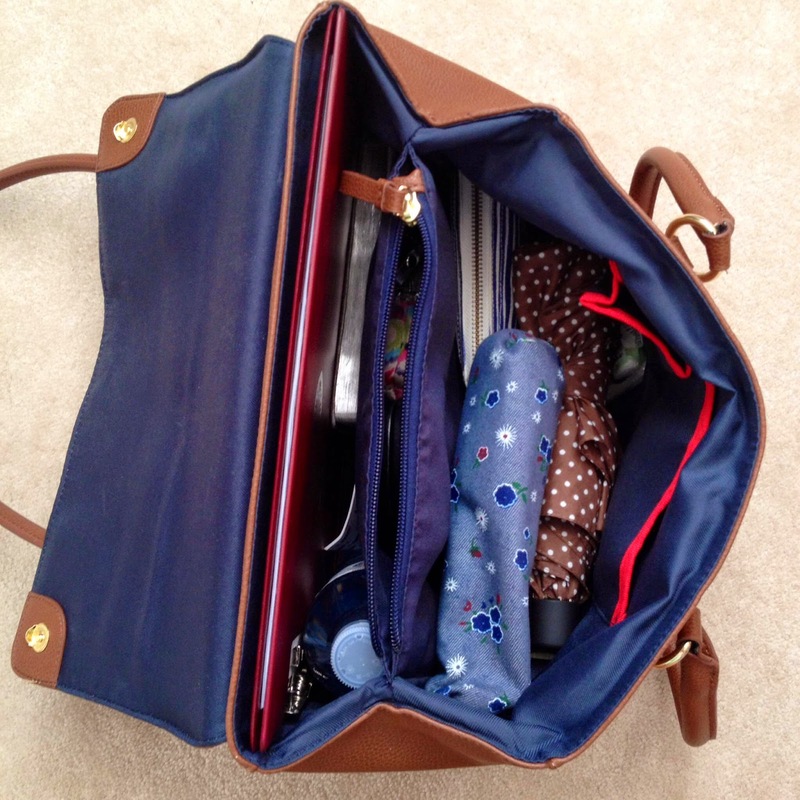 At the back of my bag I keep my folder (Mac Mac Mac!) 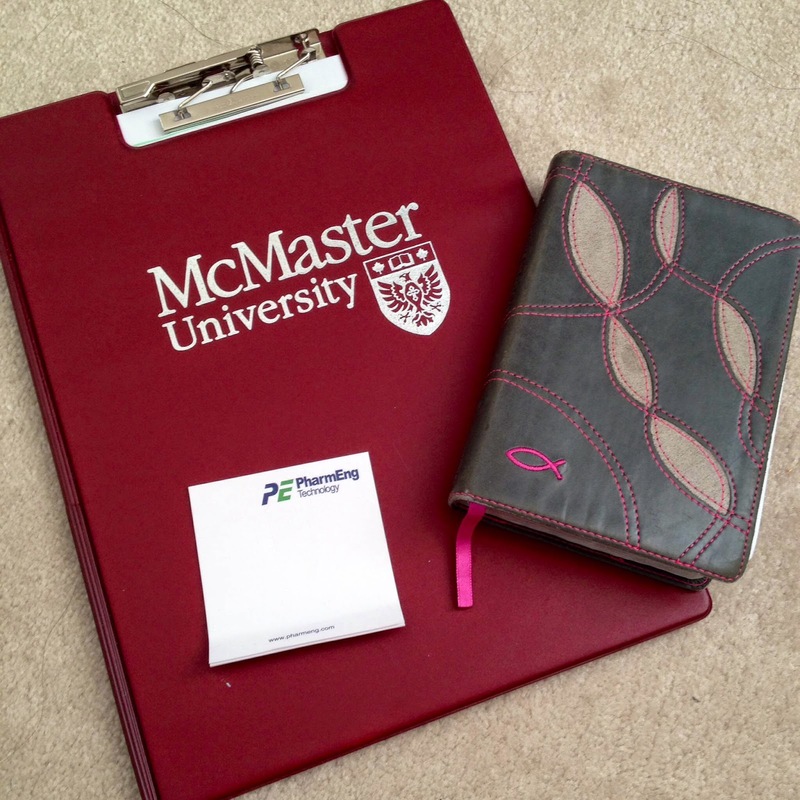 which holds documents that I need for work, stickynote pad from the company (in case I ever need to quickly write something down), and my Bible for devotional reading during breaks. I keep my Coach clutch in the middle zipper pocket. I like to use a clutch as a wallet in the summer because I can easily grab it and only carry that for quick errands or chilltimes. It also helps me narrow down what is essential or not for things to keep in my wallet so I don't end up carrying tons of cards and such. 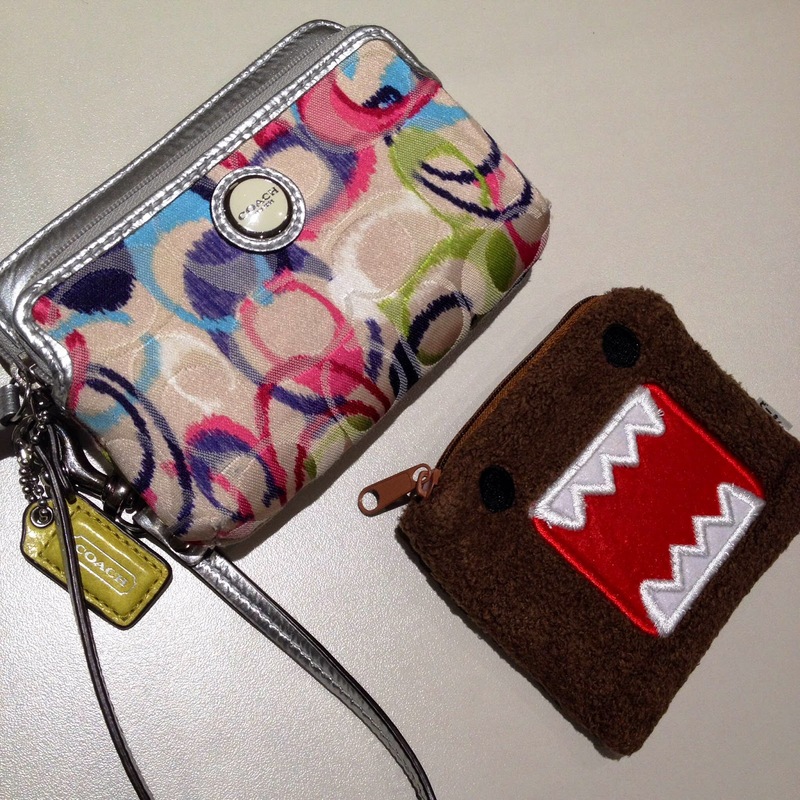 It's also big enough to fit my Domo change purse inside as well! That's everything that I have in my bag, what about yours? What are some things that you find necessary or cool to carry? Liebster Award # 2, 3 & 4!